Cook the lobsters in lightly simmering broth for 8 minutes. Cut off the heads, put the bodies and claws to one side. Crush the heads with a hammer; remove the large pieces of shell. Finely chop the shallots and fry them for five minutes in the olive oil. Add the lobster heads, cook for ten minutes, pour in the cognac, let it heat up and then ignite it, add a ladleful of broth and the liquorice, cook for fifteen minutes, strain the sauce. Adjust the seasoning. Put back on the heat, add the lobster bodies removed from their shells and the claws cracked with a hammer; reheat for five minutes. 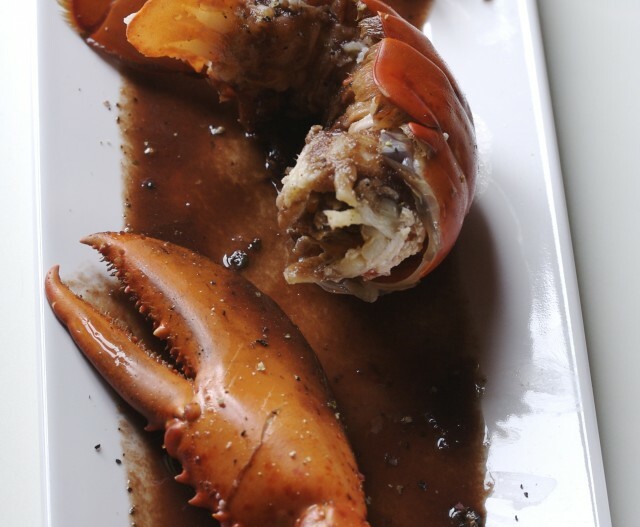 Remove the lobsters and place them on a warm serving dish, cover with aluminium foil. Reduce the sauce by two thirds. Serve with the lobsters back in their shells and the hot sauce.